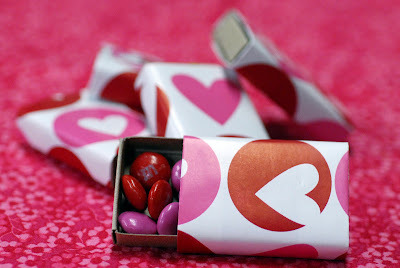 - cut small rectangles of wrapping paper, about 2x4"
- if desired, decorate with tiny stickers or tie with string. once I realized the boxes didn't slide open on their own, I didn't bother with the string. call me lazy. 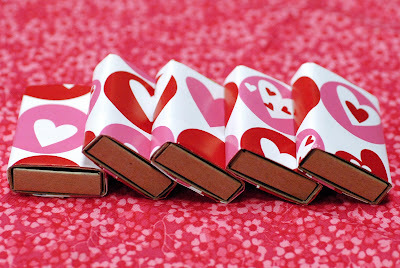 I chose heart paper, of course, but you could change these up for any season with the right holiday colors (and seasonal M&M's, of course!). 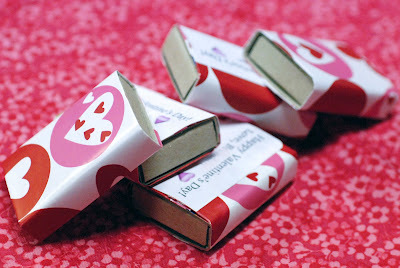 I just used a tiny piece of double-stick tape to secure the wrapping paper because I planned to cover the seam with a printed sticker (Happy Valentine's Day! Love, Boy-o). Otherwise, just a little more tape should do the trick. I think they're going to be a hit at school tomorrow! Happy Valentine's Day! 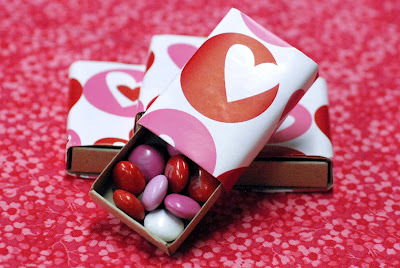 So wishing I had done something like this for V-day. The kids valentines were done last night, in crayon, and look really janky. Maybe next year I'll be creative! These are awesome!